Our online donation form allows for fast, secure payments using a debit or credit card. Though not required, you will also have the option to create an account and save your information for future donations. For your convenience, the donation form has active fields that you can complete electronically. To use this feature, make sure you have the latest version of adobe reader. Giving Circles are groups of donors who come together and make regular monthly donations to a shared cause. The Circles gather around a common goal, affording donors the power to make a significant impact with smaller, consistent donations. Thank you, NBCC Foundation donors! Visit our donor page to view a current list of donors and Giving Society members. Planned gifts are more than bequests through a will. They come in many different forms and have the potential to provide years of ongoing support for the Foundation’s programs. 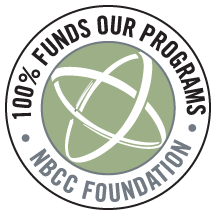 The NBCC Foundation is registered as a 501(c)(3) non-profit organization, and as such contributions are tax-deductible to the extent permitted by law. The NBCC Foundation tax identification number is 56-1939558. Financial statements are available through the website.